A chilled beam is a type of convection HVAC system designed to heat or cool large buildings or office spaces. 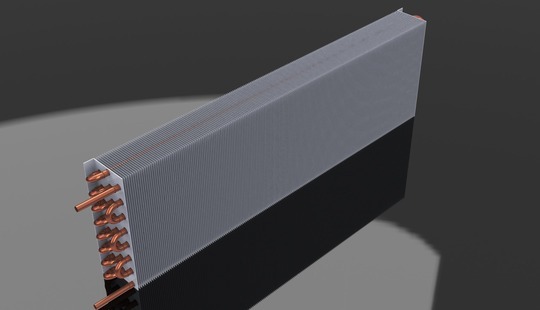 Beehive design and produce two types of chilled beam coils - passive or active. Passive chilled beams use our standard fin and tube coils, sometimes contained in a housing that will eventually be suspended from the ceiling. Some passive systems rely solely on convection whilst there is also a "radiant"/convective passive type which cools through a combination of radiant exchange and convection which can provide higher thermal comfort levels depending on the system. 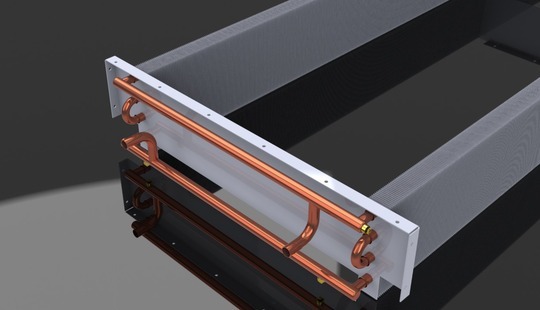 "At Beehive, we have extensive experience of manufacturing chilled beam coils and our products are used in projects all over the world"
When in operation, standard passive systems work by cooling the surrounding air around the chilled beam, which then falls to the floor and is replaced by warm air from the room which rises towards the ceiling - creating a convective air motion to cool the room. This allows passive chilled beams to provide space cooling without the additional expense of installing fan motors. Active beam designs use ducts to push (or induce) air towards the unit effectively increasing its heating or cooling capacity. This induction process allows an active chilled beam to provide more cooling capacity than a passive chilled beam in certain applications. Both passive or active beams can he supplied as 2 or 4 pipe versions with or without integral heating circuits to suit your requirements. The chilled water system must be designed to prevent the temperature of the water supplied to the heat exchanger from falling below the room dew point to ensure that the beam provides sensible cooling only. Chilled beam systems should not be designed to condense. Don’t forget to clean your coils regularly to get the best performance and life from your unit!